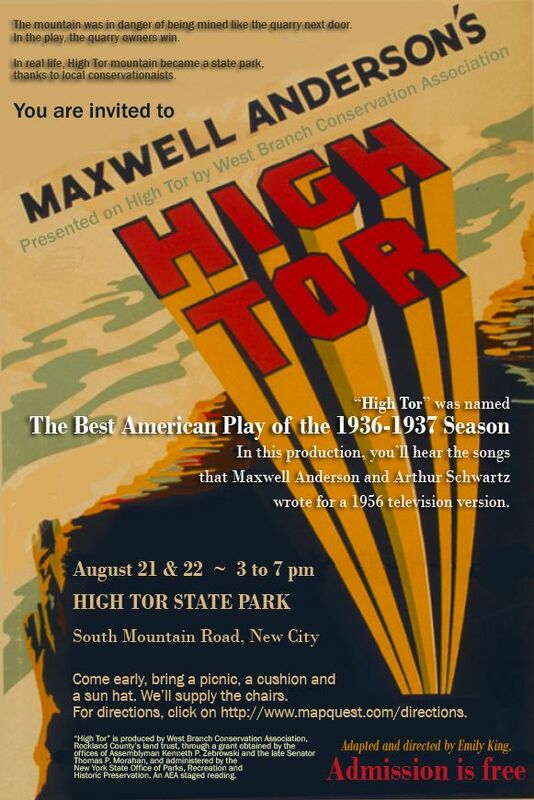 Revival of Maxwell Anderson’s ‘High Tor’ play to be performed on the slopes of High Tor | Will You Miss Me When I'm Gone? Anderson was a resident of South Mountain Road in New City, an area that had become artists colony over the years, attracting creative folks such as Kurt Weill and Lotte Lenya, John Houseman, cartoonist Milton Caniff — along with Burgess Meredith and Alan Jay Lerner, who lived just over South Mountain in Pomona. 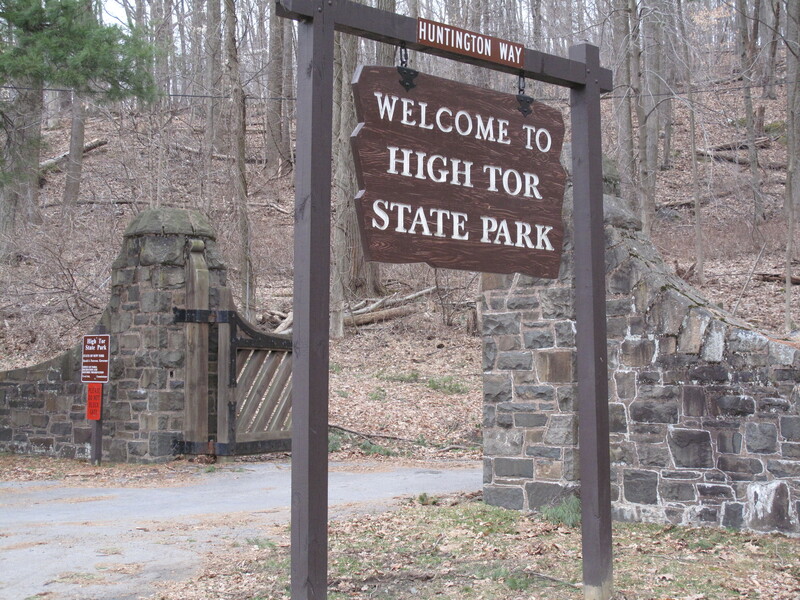 The entrance to High Tor State Park. Anderson, like many of his neighbors, grew concerned in the late 1930s about New York Trap Rock Corp. plans to quarry the mountain, effectively destroying the beautiful peak to make crushed stone for road building. Property owner Elmer Van Orden stood fast and refused to sell to the quarry company. But Anderson and his neighbors knew that Van Orden wouldn’t live forever, and feared the mountain was ultimately doomed unless they took definitive action. In 1936, Anderson, a Pulitzer Prize-winning playwright, wrote what he knew, and called it High Tor. It was a fantasy that built on the local legend of Rip Van Winkle and pitted residents against quarry owners. Property owner Van Van Dorn (the name was changed for the play) fought the money hungry quarrymen who wanted to “chew the back right off this mountain ” but ultimately lost the battle. The play helped start a serious movement to by galvanizing neighbors and environmentalists to preserve the peak. 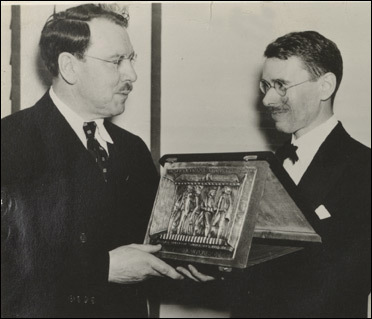 In 1943, after Van Orden’s death, citizens groups raised the funds to purchase some of the land and turn it over to the Palisades Interstate Park Commission for preservation. Grassroots groups also persuaded millionaire railroad magnate Archer Huntington to donate his adjacent estate of 470 acres to the park commission to the park commission. Decades after High Tor became a state park , 78 acres were added to it as a result of litigation by West Branch to prevent development. These included the Van Orden farm, the actual site of the play. West Branch is producing the play to increase public awareness of the many artists who have lived and those who still live on and near South Mountain Road, and their work. High Tor. 3 p.m., Aug. 21 and 22. On the grounds of High Tor State Park, 417 South Mountain Road, New City, NY. Click here for directions. Totally free, including parking! Audience members can picnic in the park before the show. This entry was posted in Free, History, Music, News and tagged Alan Jay Lerner, Archer Huntington, Burgess Meredith, Hesper Anderson, High Tor, High Tor State Park, John Houseman, Kurt Weill, Lotte Lenya, Maxwell Anderson, Milton Caniff, New CIty, New York Drama Critics' Circle, New York Trap Rock Corp., Palisades Interstate Park Commission, Pomona, Pulitzer Prize, Rockland County, South Mountain Road, West Branch Conservation Association. Bookmark the permalink. I lived on South Mountain Rd. from 1948 to 1958 on my uncle, Jim Mackey’s farm. The farm was on the lower road in an area called Centenary. What a great place to grow up. Now at 73 years old I have seen the road in the last ten years and am sad to see how much things have changed. But, like all things, change comes to everyone and everything. I still have the memories of times gone by and how happy those times were. Dear Daphne: Thanks so much for reading this post and taking the time to respond. I know things have changed a great deal since your time living on South Mountain Road. I’ve been on South Mountain Road, just west of Zukor Road, for the last 15 years or so. I can attest that many things have changed in that time, too. While different from what you remember, it’s still a great place to live, where even the lack of sidewalks and an overabundance of too-fast cars hasn’t managed to kill the area’s good sense of community, history and ecology. I would that I shall always treasure if I may recall my halcyon days riding my bike from my parent’s home in Pomona to my uncle’s in New City. The county has always hosted destroyers of nature and I’m glad of the successes in thwarting them for what has become the public good, but, in my time it seemed to all belong to me. Today, I reside in the American Southwest, having left 43 yrs ago.